An All-American decathalete and punter at Florida State, Rohn Stark was the most decorated punter to play college football since Ray Guy. (He was also a killer punter during the 80s and 90s with the Colts. He not only played for the Indianapolis Colts but also the Baltimore Colts- before they got in the Mayflower trucks and headed East.) 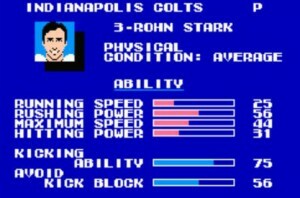 Stark would also be a part of probably the best kicker and punter combination in Tecmo Bowl being paired with Dean Biasucci, and ironically year over year they’d be the most consistent part of the Colts through their combined tenure up to the end of 1994. Originally drafted by the Baltimore Colts in the 2nd round of the 1982 draft, Rohn would really come into his own by 1983 where he’d be named 2nd team AP with a gaudy 45.3 average and lead the league with over 4100 yards. His 1984 would be equally impressive as Stark would lead the league with 98 punts that season. 85 and 86 would be ProBowl caliber seasons, leading the league in average yards per punt with a 45.9 and a 45.2 yard average respectively. While the rest of his career would not see him reach such levels- Rohn would never average below 40 yards per punt during 13 seasons but would return to the ProBowl again in 1990 and 1992. With free agency and the salary cap making players and positions more expendable, Stark would leave via free agency in 1995, playing one season in Pittsburgh where he made his lone SuperBowl appearance. In 1996 he’d put his skills to work for the Carolina Panthers, and in 1997 finish out his career with the Seattle Seahawks. Rohn also held on extra points and field goal attempts and was notably left footed- meaning the ball was spinning the opposite direction than punt returners would expect after he would punt it. Stark holds another odd accomplishment as the only Baltimore Colt to play against the Baltimore Ravens. At the time of his retirement in 1997, Stark was top 5 in career punts and yardage. Stark like many other punters, will probably never get his due as the NFL HoF shows little respect for the position.